The Play Therapy Dimensions Model is an integrative approach that provides play therapists with a framework from which to conceptualize the play therapy process and evaluate their therapeutic interventions when working with children. The model serves as a decision-making guide, offering various reference points for examining the Who, What, When, Why, and How of play therapy. 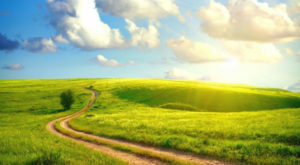 As a decision-making model, it is especially helpful to those therapists who work from an integrative perspective, as it highlights the ways in which existing theories and techniques interact within two primary dimensions (Consciousness & Directiveness). Based on the assumption that each child seen in therapy is unique, which requires the play therapist to tailor interventions to the child, the Play Therapy Dimensions Model provides an organizing framework for decision making. Supervisors and supervisees will find the model invaluable as a framework for tracking therapist use of self, examining the applications of theoretical models, movement in the play therapy process, and evaluating treatment progress. There has been much written in the adult psychotherapy literature about integrative approaches to therapy. Through the 1970s there was a proliferation of writing that contributed to the thinking about what the terms integrative or (as many described themselves) eclectic mean. Eclecticism was harshly criticized as “a hodgepodge of inconsistent concepts and techniques” (Smith, 1982 p. 802). The random use of techniques and theory was discouraged. At the same time the use of a single school of practice was also viewed as being limited. Integrative therapy is considered to be a purposeful weaving of theory, techniques and common factors identified across therapies (Norcross, 2005). Although being integrative requires an approach and a way to decide how to work with a client, Garfield (1994) noted those who described their work with clients as integrative said that they followed what was best for their clients, but described differing decision-making processes and differing theories and techniques from one another. Even with the current availability of defined integrative practice approaches, it would appear that there is not enough outcome research that shows what integrative therapists do and if what they do is really that different to purest therapists (Garfield, 1994; Glass, Victor, & Arnkoff, 1993). The question is do integrative therapists follow a decision-making model for their client work and if so what is it? The current status is there are four main approaches of psychotherapy integration in the adult psychotherapy literature: 1) Common factors approach which focuses on the common underlying factors shared by different therapies which generally include catharsis, acquisition and practice of new behaviors, and the client’s positive expectancies (Grencavage & Norcross, 1990); 2) Technical integration which is prescriptive in nature in that it focuses on the best treatment for the client and the presenting problem. The treatment choice is based on research about others who present with similar issues (Lazarus, 1976); 3) Theoretical integration, which draws on two or more theoretical approaches to therapy. Essentially, the practitioner attempts to weave different theories and techniques together to best serve the client; 4) Assimilative integration which is when the therapist begins with their core training approach to therapy, but they may borrow or select from other approaches to incorporate a new way of working with the client. The therapist is viewed as grounded in a theory while being flexible in their use of a range of other theories and techniques, perhaps creating new ways of working (Norcross, 2005). Much of the play therapy literature on integrative approaches to therapy is anchored in reported case studies. This being said, some play therapists appear to be making use (knowingly or not) of the above integrative approaches to working with children. Drewes (2011) identified Kenny and Winick’s (2000) use of technical eclecticism with an 11- year old autistic girl where a sequential treatment approach was utilized; Kevin O’connor’s (2001) use of Ecosystemic play therapy was noted as an example of theoretical integration where he incorporates components of analytic, child-centered, cognitive, Theraplay (Jernberg, 1979) theories as well as concepts of personality and psychopathology in his treatment planning and goal setting; Wier’s (2008) use of common factors in work with an adoptive family where commonalities across play therapy treatment techniques for Reactive Attachment Disorder were utilized; and Fall’s (2001) case study using assimilated integration to treat a child in a school setting. Fall used the core theory of child-centered play therapy, but blended this approach with Adlerian and cognitive-behavioral theories and techniques. Therefore, students graduating will call themselves eclectic, but what they are really saying is that they have been taught two different approaches (usually cognitive-behavioral and Rogerian). Consequently, they are not fluid in thinking between the two theories and approaches and they do not feel well-grounded in either approach, resulting in an inability to truly integrate them. Thus, a truly integrative approach is lacking (p.37). Those who have been trained in a pure play therapy approach in a university setting are few as there are not many comprehensive programs offered. Those who have come from a specific play therapy model of training tend to be clustered geographically due to living near training centers or universities that offer full training programs such as North Texas University. Otherwise, it is more often that those seeking training in play therapy arrive with their adult-focused academic training backgrounds, many of which have been influenced by postmodernism. These therapists generally claim to be eclectic practitioners. Coscolla, Caro, Avila, Alonso, Rodriguez & Orlinsky (2006) make the controversial claim that historically psychotherapies were developed during a culture of modernity and there has been a cultural shift to postmodernism and that this influences the psychotherapists’ attitudes regarding theory. They state that eclecticism is postmodern and that integration has roots in modernism. Coscolla et al. use the work of Norcross and Newman (1992) to delineate the ways the two words are characterized. The terms used to describe integration include a belief in theory, a seeking to find agreement between theories, and a focus on developing better approaches and legitimization through scientific methods while eclecticism focuses on functionality, no “grand” narratives, everything goes and it is based on clinical needs. This is one conceptualization and there are others who may find different anchors to differentiate the two terms. It is an interesting discussion as we are in the midst of cultural change in the ways we philosophically view the world and how we go about understanding problems, processes, approaches and outcomes in therapy. No matter what theory, approach, model, or world-view you come from, decision-making frameworks are lacking for integrative therapists. As previously noted, there are at least four approaches for integrative therapists who work adults, which provide basic guidance without providing standard approaches to decision-making. However, the ways in which the integrative approaches are viewed differ greatly from therapist to therapist. Stricker (2010) argues that the current categorizations for integrative therapies (although helpful) have blurry boundaries for research purposes. The more detail that is put forward, the more complex and hazy the boundaries between the integrative approaches become. Sticker claims there may be two ways to move ahead: 1) expand the categories or 2) abandon the categories. In other words provide more clarification categorically or simplify the way to view integrative therapy. Practitioners and researchers are looking for ways to explore integrative therapy in order to identify common pathways to this way of working with clients. Without a decision-making process that is relatively standard, integrative play therapy may continue to be at risk of slipping back to looking more like eclecticism. The Play Therapy Dimensions Model is an integrative approach that provides play therapists with a framework from which to conceptualize the play therapy process and evaluate their therapeutic interventions when working with children. 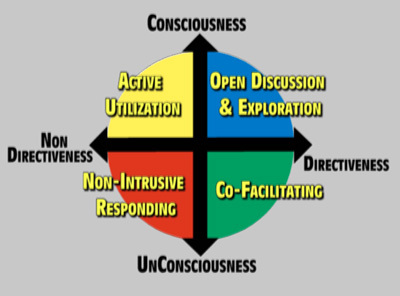 While recognizing that there are fundamental philosophical differences between schools of play therapy, as well as shared viewpoints, the Play Therapy Dimensions Model conceptualizes the play therapy process according to two primary dimensions: Directiveness and Consciousness. These dimensions help define the therapeutic space in a manner that most practitioners will recognize as fundamental to the change process. The Consciousness dimension reflects the child’s representation of consciousness in play, and is represented by the child’s play activities and verbalizations. The second dimension, Directiveness, refers to the degree of immersion and level of interpretation of the play therapist. These two dimensions intersect, forming four quadrants. Depending on the case conceptualization, and the theoretical approach of the therapist, a therapist might choose to focus therapy activities primarily in one quadrant. Alternatively, there may be a number of indicators that suggest movement is required amongst the quadrants. Furthermore, movement may occur within a session, or across sessions, as the therapy process evolves. As will be discussed, this conceptualization assists therapists in navigating the complex client-by-therapist-by-treatment interactions in order to tailor treatment approaches and optimize effectiveness. This integrative approach also offers a process-oriented framework, providing guidance for tracking important change mechanisms. The Dimensions diagram provides a visual template of the dimensions of consciousness and directiveness, which assist the therapist to identify therapeutic movement during sessions and across sessions. Visual mapping of therapy activities raises the awareness of the presence of integrative play therapy decision-making. The model will appeal to those individual treatment-focused practitioners as well as those who are practicing from a systemic framework. It is our view that play therapy in itself is an efficacious form of treatment and is most productively embedded in parent work and systems-based consultations and interventions. It is a widely held belief that parents should contribute to the formulation of goals for therapy and must be informed as to treatment progress. Through helping parents learn more effective ways to deal with their child’s emotional needs, personality, and developmental or adjustment issues, therapists can secure their support and enhance therapeutic outcomes (McGuire and McGuire, 2001). How do Integrative Therapists Make Decisions? The Play Therapy Dimensions Model provides a fluid process for decision-making. There are a number of scales and tools for the play therapist to use to track their continual decision-making process. These tools provide all play therapists a way to identify and manage their on-going clinical decisions. The Appendices (A, B, and C) assist in regular systematic tracking. One of the main obstacles to research in integrative therapy is that integrative psychotherapy can be highly complex and that decisions regarding treatment are being made on a continual basis throughout therapy (Beutler, Consloi, & Williams, 1995). Beutler et al. (1995) also note that the client characteristics change over the course of treatment, which shifts the way in which treatment is delivered. The Child and Therapist Moderating Factors Scale (Appendix A) helps the play therapist to track these ongoing shifts and changes in their child client. Appendix A also tracks the child and therapist treatment interaction factors. The Degree of Immersion: Therapist Use of Self Scale (Appendix B) tracks session by session ways the therapist makes use of the self with the client and also asks for a description of the client response to the therapist use of self. Because the tool is not about techniques, it helps a range of play therapists to be aware of the how of the process rather that the what. The Play Therapy Dimensions Model is also useful for qualitative, quantitative or mixed methods research due to the establishment of a way of systematic recording of the play therapy processes at 4 levels: 1) Child Characteristics 2) Therapist Characteristics (including skill therapist skill level) 3) Therapist Use of Self (and corresponding child client responses), and 4) Session Tracking and Observation Form (including play skills, identification of work in consciousness and directiveness dimensions, development, play process, relational and affective markers, play themes and a summary). Each of the recording forms looks at a different part of the play therapy process and identifies when changes in direction, intensity, directiveness or consciousness in play therapy should shift. How does the therapist decide to be more integrative? The child client directs the changes (verbally, non-verbally or metaphorically through the play). Although adult models of therapy have addressed a client-driven focus (Miller, Duncan & Hubble, 2005) whereby the wishes and needs of the client ascend the theoretical and technical approaches of the therapist, this has not been as clearly identified in the child therapy literature. A possible explanation for this difference is due to the developmental and inherent power differences between the therapist and child and the assumption that the child cannot express himself in the ways an adult client can. There is no research to support whether therapists consciously shift from utilizing a primary model of therapy to working in an integrative way (Schottenbaurer, Glass & Arnkoff, 2007). Specific guidance in therapeutic decision-making was one of the goals of the Play Therapy Dimensions Model for those working with children. In the adult literature, authors concur that a common theory for decision-making processes for therapists would be valuable (Beutler & Clarkin, 1990; Beutler et al., 1995; Street, Niederehe, & Lebowitz, 2000), but currently there is no common adult based decision-making process for psychotherapists. 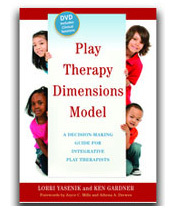 The Play Therapy Dimensions Model is based on contextual considerations for the child client. We concur with Zuber (2000) who refers to patients’ varied ways of describing their problems, which in turn affects the decision-making of the therapist regarding how to work with the patient. The importance of client input regarding clinical intervention is highlighted. The same thinking can be applied to work with children, except their explanations of their problems are presented in verbal, non-verbal and metaphorical ways in play and their input is often more non-verbal. Early on we realized the skill set for the play therapist needed to be broadened from that of being an adult therapist to working with children. Therapists needed assistance to know what they were looking for in their work with the child so that they could address the unique presentations and preferences of the child. Otherwise, the therapy interventions would likely be driven by therapist preferences and parent or third-party expectations. Do Decision-Making Theories designed for Adults fit for Play Therapists? There are well-known and emerging decision-making theoretical frameworks for adult integrative therapists. The well-known subjective utility theory consists of analyzing decisions by reviewing all possible outcomes, assigning probabilities to each and choosing the best decisions with which to proceed. The problem with this approach is that it is biased, it can be overly inclusive, it is not based in the moment and therapeutic decision-making is not always a rational task to be sorted in advance of the process (Schottenbauer et al. 2007). Emerging decision-making approaches identified by Schottenbauer et al., include, information-processing theory and bounded rationality theory. Information-processing theory uses symbolic and qualitative reasoning derived from transcripts from therapists that provides, as Elstein (1988) states, “what knowledge structures, cognitive operations, and rule structures are necessary and sufficient to produce clinical reasoning” (p.19). Through this analysis, therapists may be able to understand how their original theoretical orientation and the theories and techniques that were brought in to the therapy interact. Schottenbauer et al. ponders “whether clinicians using psychotherapy integration use more strategies, or more complex strategies, than clinicians using pure-form therapies” (p. 233). Bounded rationality (although not a new construct) as discussed by Gigerenzer (2001) is a decision-making process that takes note of the practical limitations for therapists such as resources, time and knowledge and computational capacities– which differs from the boundlessness of utility theory. The term satisficing is used to describe the process of gathering information in a timely way and making decisions. The decisions are made using search rules (determining alternative actions and gathering cues), stopping rules (one or more criteria is met before a search for alternatives is sought and different course of action or decision is made). Medical model diagnostics use stopping rules by listing criteria or characteristics to choose from in order to make a diagnosis or move on to another way of viewing the client situation. Decision rules are made based on heuristics and on the limitations of time and information available about the client. “The theory of bounded rationality considers three basic elements relevant to the decision-making task: psychological plausibility, ecological rationality and domain specificity” (Schottenbaurer et al., 2007, p. 235). The Bounded Rationality theory of decision-making appears to offer some theoretical direction to the Play Therapy Dimensions Model decision-making structures. The difference that theory makes is that it suggests where to focus. The point that Bounded Rationality theory makes is that therapists could not possibly process all the information about a person or situation – even if they had access to it all. Given time and different pieces of information a person may make different decisions, but they would still have to select among information and use some rules to do so. Bounded Rationality theory supports the development of techniques, habits and standard operating procedures to facilitate decision-making. The theory also sheds light on the cues therapists use to consider one direction over another in their work with clients. Elements of the theory appear to drive the intended use of the Play Therapy Dimensions Model structured tools. The therapist can optimize their treatment decisions through the ongoing recording of observations of self and other, the tracking of the play therapy process across the dimensions of consciousness and directiveness and the therapeutic interaction between these areas. Generally, we have found play therapists bring a wide variety of therapy skills and experience to their work with children. As trainers, what became clear was that it was difficult for play therapists to hold and later process the incoming information gathered during play therapy sessions without the use of tools to anchor their experience. Therapists needed a way to observe and record the play therapy process in order to feel they could evaluate the decisions they were making (either intuitively or consciously). The result of consistent use of the structured forms is that therapists began to make better decisions due to having a framework through which to evaluate their work. They could get feedback in supervision in ways they could not otherwise due to using a shared language with which to speak to the supervisor about what was happening. They could make better plans and provide broader feedback to third parties. The best part of the process is that the Play Therapy Dimensions Model found a way to be inclusive to all theories and models of play therapy. In summary, it is not necessary to practice as an Integrative Play Therapist, but it is important to know when you shift to work with a child in an integrative way. It is equally important to look to the literature to identify an approach to integrative therapy and to identify your decision-making theory. The Play Therapy Dimensions Model structured forms and conceptualization diagram can assist you to be systematic in your work with children and to use this information for research purposes. It will not matter what approach to integration you choose, the structure will help you become a more effective practitioner and decision-maker.